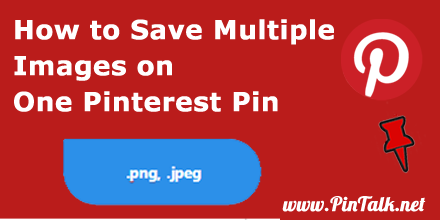 How can a Pinterest Pin have multiple images in one post? Pinterest Pins can now have up to five images in on one Pin. The new feature is known as a Pinterest Carousel Pin. Up until the Carousel was introduced, Pinterest Pins only contained only one image or video. Promoted Pins (Pinterest’s paid ads) could also use animations to attract viewership. For single image Pins, when a user taps on a Pin, they click through to the associated website, if there is a URL attached to the Pin. There is only one image in the Pin, along with a text description. Carousel Pins present another opportunity to use the highly visual nature of Pinterest to help guide users through the buying decision. A Carousel Pin is one with multiple images on one Pin. It gives viewers the opportunity to swipe through up to five images before they choose to click through to the website or make a buying decision. The first image appears as the top or cover image. The other images are only seen if the Pinterest user swipes left to see the next image. It is a similar post structure to an Instagram post with multiple images. Pinners do not have to use all five images and can only use .jpeg and png file formats in Carousel Pins. 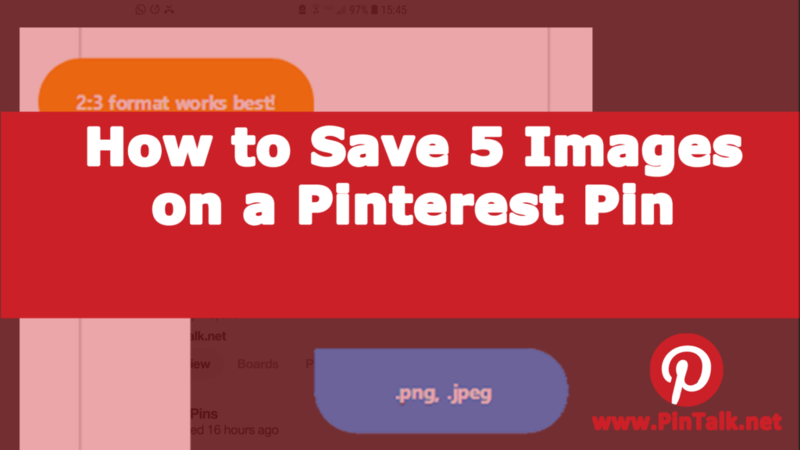 Up to five images may be saved on one Pin. Why Use Multiple Images in a Post? More images mean increased opportunity to show off your product, share steps in a recipe, or show variations of a product. The best strategy is to use the image you want the reader to see on top. Not all readers will bother to swipe left to see the other images, so put the best image on top. However, the additional images give you the opportunity to share more information about your product, brand or service. Carousel pins cannot be edited after they are saved. Double-check your titles, descriptions, and be sure you inserted a URL as a link before selecting Save. Carousels only support .jpeg and png file formats with a maximum of five images per Pin. Is the Carousel Only for Promoted Pins? Pinterest carousel Pins are organic (free) pins. It seems that Carousel Pins are only available to business accounts at this time with all business accounts that we manage having access to this feature. There is an “early access” annotation next to the feature, so maybe this is an indication that Pinterest carousel Pins will be available to everyone in the future. If you have the time and resources, then set up a test to see which image performs best on your Carousel Pins. Set up two Pinterest Pins with identical content – description, hashtags, and link – but different images. On the first Pin, put image A on top and image B second. 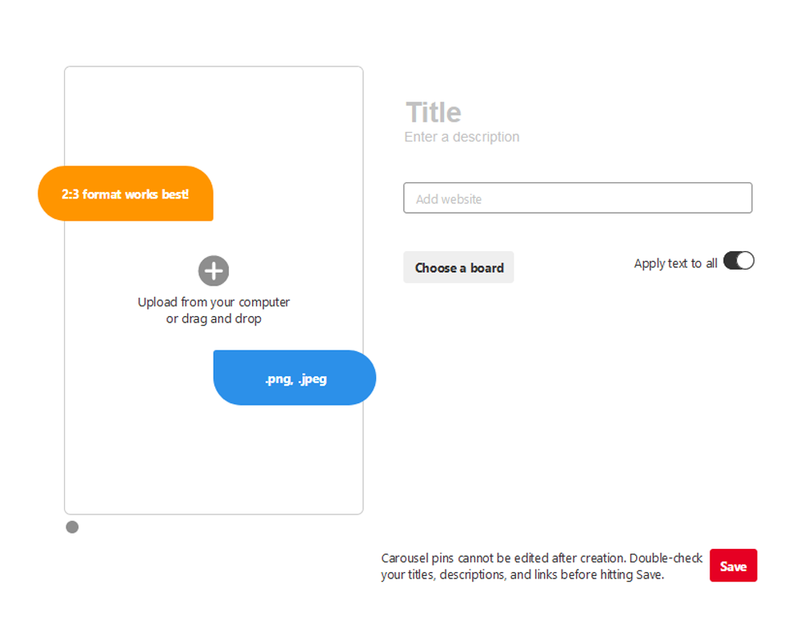 For the other Pin in your test, use the identical description and hashtags, but reverse the order of the images. In the second Pin, image B is on top. This strategy will give you an idea of which image is more appealing to your audience. The reversed images can also be used to prevent banner blindness. Converting to a Pinterest business account is free. You will have access to the advertising platform known as Promoted Pins. More importantly, you will see analytics about your Pinterest activity and viewership. This can give you valuable insight into what type of content your audience is most interested in seeing. Converting to a Pinterest business is straightforward. 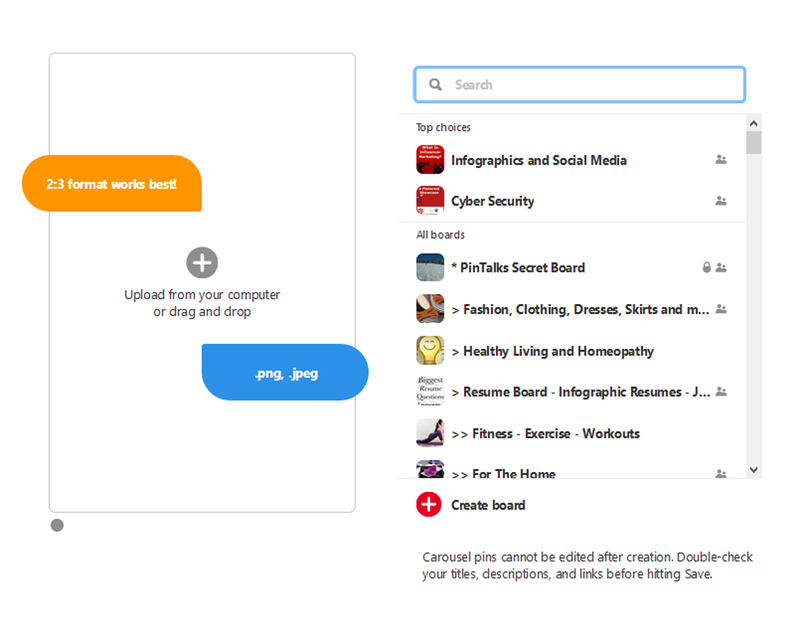 You will have to connect a top level domain name to your Pinterest. If you have a WordPress website, that this is easy. If not, you and verify your ownership of a website via FTP’ing a file up to the website. It only takes a few minutes to connect a website to Pinterest. While you’re at it, connect your Instagram or YouTube channel so the content there will be attributed to your Pinterest profile.